Do you feel compelled to make New Year’s resolutions every year but dread it because you know you won’t follow through? This year make one of these 5 healthy resolutions you can actually keep instead. Happy first Monday after the new year! I don’t know about you all but since the new year started on Friday I treated the long weekend as one big holiday and decided to wait until today to get on my healthier kick after totally indulging the past couple of weeks. I’m going to start out by saying that I’m really not one for resolutions. Most of us seem to want to make these huge resolutions that while, yes, will probably make us a lot healthier, aren’t overly realistic. This just leads to giving up shortly after and being disappointed in ourselves. But, hang on with me here. I much rather make small goals to start the new year fresh with that I know I can pretty easily achieve with a little work on my part. 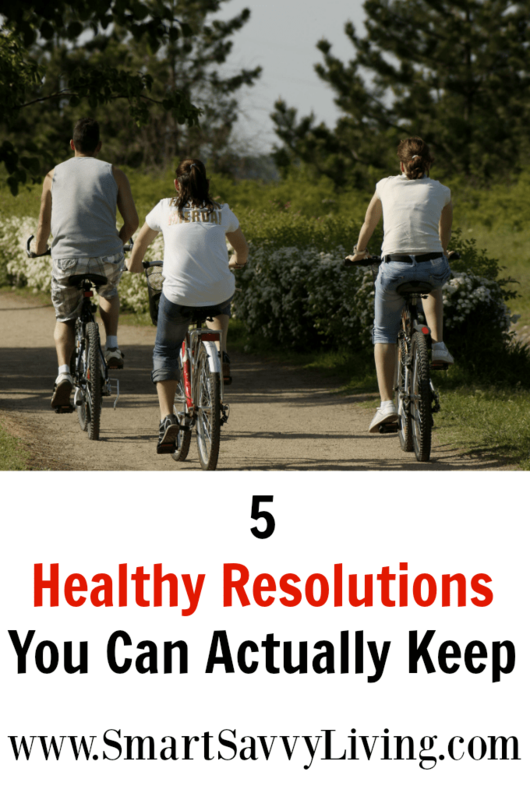 As such, I wanted to share 5 healthy resolutions you can actually keep. Most of these probably sound rather familiar, but, to me, it’s all in how you execute your plan. 1. Eat more fresh food. With most of us having super busy lives that are often torn between spending more time on work or with family, it’s hard to find time to constantly prep and cook fresh foods for each meal. I even love cooking from scratch and can physically and mentally feel a difference when I only eat fresh foods and still often have trouble with this. Here are some of my tricks for meeting my fresh food goals without sacrificing or ending up going through the drive-thru. Make a meal plan so you aren’t wasting time wondering what to cook. Prep fruits and veggies for cooking and snacking while doing things like talking on the phone or watching TV. While they do cost more, many stores also sell prepped produce like fresh cut or shredded fruit and veggies. You can also find many vegetables like onions chopped and frozen, which, in my opinion, is the next best thing to fresh. 2. Drink more water. I think most of us have gotten the memo at this point that we should probably be drinking more water. However, this isn’t always easy to do, especially if you reach for your favorite caffeinated beverage often throughout the day to keep you going. Yes, most of those beverages are made with water, but usually also include various sugars and are diuretics (which make you pee and thus dehydrate you even more). Drinking just regular water is best, but it can be boring and hard to drink if you’re used to flavored drinks. To change things up, add fruits like citrus or berries to your water, drink herbal teas (my favorite is this peppermint tea I get on Amazon.com), and add a small amount of juice to sparkling water for a soda replacement. I also carry around a reusable bottle of cold water (this thing will literally keep ice for over a day and also comes with a tea/fruit strainer) and won’t let myself have other drinks until I finish it. 3. Move around more. I’ll be the first to admit that since I’m in front of the computer most of the day, moving around more is pretty much almost always on my goal list. To help me move around more I set a timer so I remember to get up and walk out to get the mail, empty the dishwasher, wash a few dishes or other chores that get me moving around a bit. I also use an under the desk bike and you can even get a nice treadmill desk these days. If you work outside the home, you can do simple things like parking further from the building, taking small breaks to take a short walk to talk to a co-worker instead of emailing, and taking a short walk during your work break. If you like to watch TV at night, it’s also a good time to do things like walking in place or using an exercise bike, using small weights, or stretching. Being active with friends or family doing an activity or sport that you really enjoy is also a great motivation to move around more. 4. Take more me time. Even though I do sometimes get taken advantage of, I do love the fact that I’m naturally a giver. It’s hard for me to say no to helping others, but it also means I don’t take nearly enough me time. However, I know that if I don’t take enough care of myself and end up getting sick or burnt out, it creates a chain reaction of other things turning into a train wreck like who’s going to make dinner and can no one else really wash the dishes or balance the checkbook? So, every day I strive to take at least 5 minutes, but preferably 15, a day to just clear my head for me. I like to take a hot bath, read a book (I recently got a Kindle Paperwhite that I love), listen to whatever song fits my mood, catch up on a TV show, or even just meditate. You may have to just sit in the parking lot or lock yourself in the bathroom to get a few minutes by yourself sometimes, but it’s amazing how much those minutes can help to recharge you. 5. Be “connected” less. While I realize it’s pretty much a first world problem, it can be hard to truly disconnect these days. I’ll be the first to admit that from time to time I’m looking at my phone more than I’m paying attention to what we’re having for dinner. Sometimes it’s because I feel like I need the entertainment while others it’s because something important is going on for work. Either way, it’s easy for this to become a habit which we all know isn’t healthy. So, to connect less, come up with some times that are really important to you that you know you can for sure disconnect all the electronics and entertainment. Maybe it’s while you’re having dinner, or it could be while you enjoy after dinner coffee with your partner or while you read a bedtime story to your kids. It’s so important in today’s busy world to remember just how important uninterrupted face-to-face connections are. If you do have a job where you must stay connected or are out for dinner and obviously want to know if the babysitter calls, I simply set up a unique ringtone and/or text alert for that specific number so I know that I should check my phone if I hear it. If I hear my normal ringtone, I ignore my phone unless I get multiple calls in succession that I know must be important. So, what do you say? Will you be making one of these 5 Healthy Resolutions You Can Actually Keep this year?